Mobile Web Server is a personal zero configurable web server with worldwide Web access to pictures, music and other files stored on USB flash or in a hard disk folder. Mobile Web Server creates web sites from separate files with auto-generated site navigation menus and picture thumbnails automatically and on-the-fly. Mobile Web Server supports web templates. 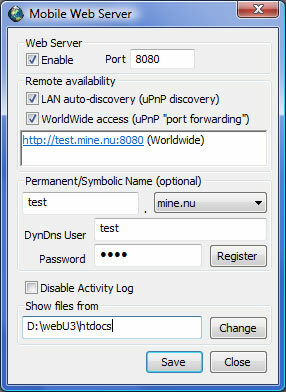 Mobile Web Server allows the site visitors to determine the server geographical position on the map with GPS.